To help us not get separated in the low visibility waters, we used a buoy line as a reference for our descent. 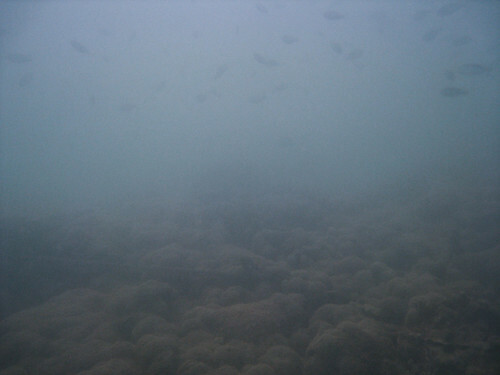 The line was heavy encrusted with hydroids, coral, sponges and algae. Hiding amongst the coral, or possibly feeding along it, was this Fan-bellied filefish Monacanthus chinensis that accompanied us along our descent. 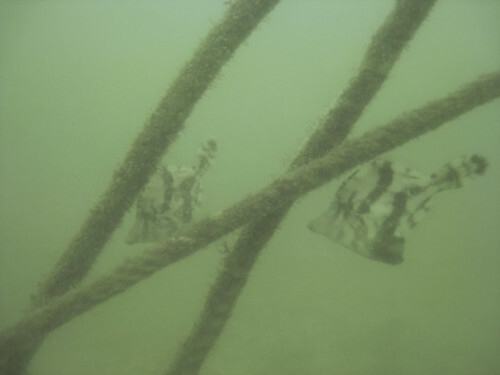 When we reached the end of the buoy, there was another, smaller filefish hanging out by the ropes. Upon the encounter, the two filefish began communicating by flicking their dorsal spines, flaking each other and changing colours. It was hard to tell if they were engaged in friendly or hostile communication. That said, there was no resulting fight or confrontation. After the exchange, the two just resumed their original business of calmly hovering alongside the ropes! 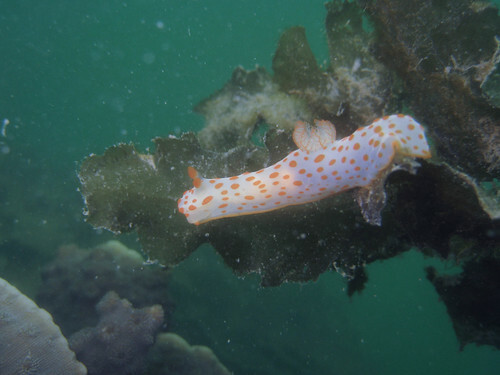 Also at the end of the buoy line was this Pterolina ianthania nudibranch. 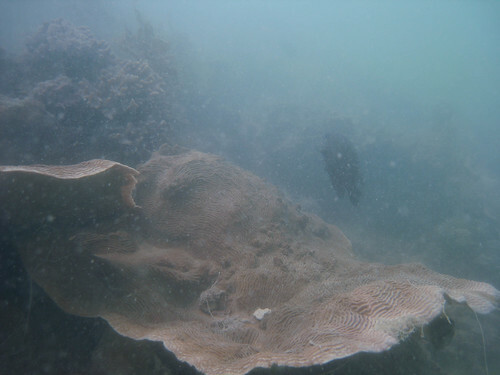 This might not look like much, but the area around this Pachyseris coral serves as a cleaning station for the fishes on or visiting the reef. 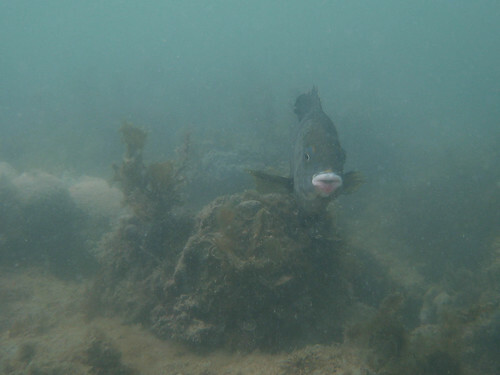 The Three-spot damselfish Pomacentrus tripunctatus in the photograph has assumed a stationary and vertical cleaning position. It’s waiting for the Halichoeres wrasse to begin nipping parasites off of its body. I didn’t manage to get the wrasse in this photo as it was darting around the coral real quick. It nips and goes. Nips and goes. Probably because my presence made it somewhat cautious. 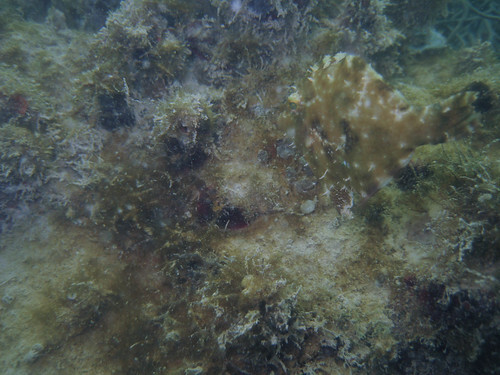 Here’s an example of how well camouflaged a filefish can be. Do you spot the fish? This area of the reef belongs to a Honeyhead damselfish Dischistodus prosoptaenia. The brownish alage you see in this photo is being “grown” and tended to by the damselfish. Honeyhead damsels feed on this algae and will aggressively chase away intruders from their garden territory. 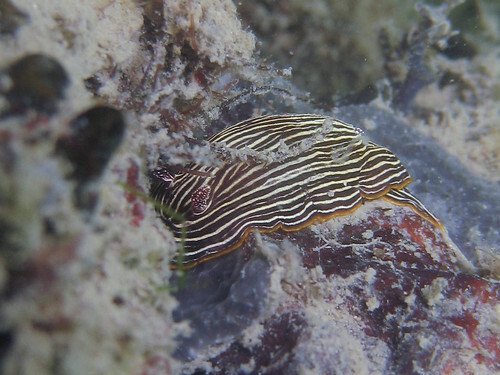 So it probably is worthwhile for the filefish to not make its presence known as it enters the damselfishes’ territory! 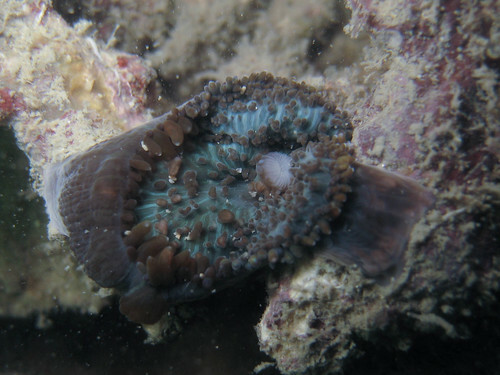 A strange anemone that’s straddling two pieces of coral rubble. 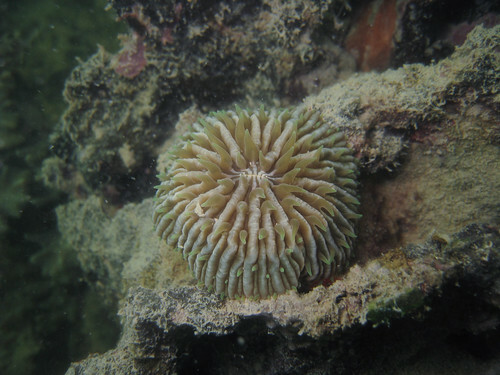 A little baby mushroom coral that’s still soft and attached to the reef. Mushroom corals are free living corals, so when it matures, it will detach itself and be able to “roam” and travel around the reef. 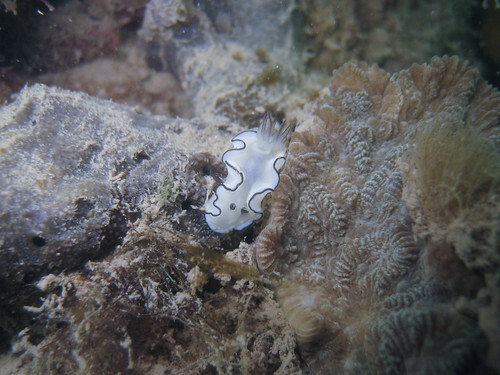 One of the trainee guides, Audrey Pang, spotted this Gymnodoris rubropapulosa nudibranch upon a blade of Sargassum algae. 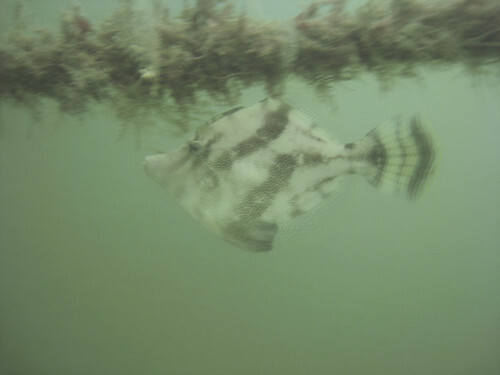 We often spot them on Sargassum and occasionally on sponges too. 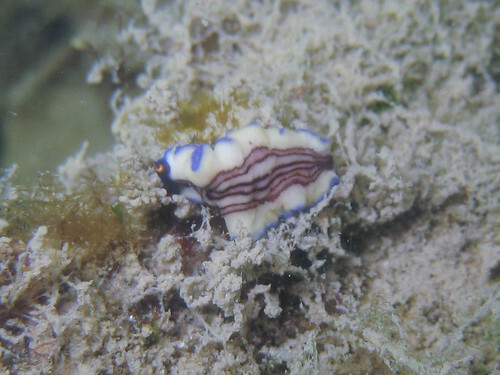 … and an equally tiny Glossodoris atromarginata (top) and Chromodoris lineolata (above) nudibranch. 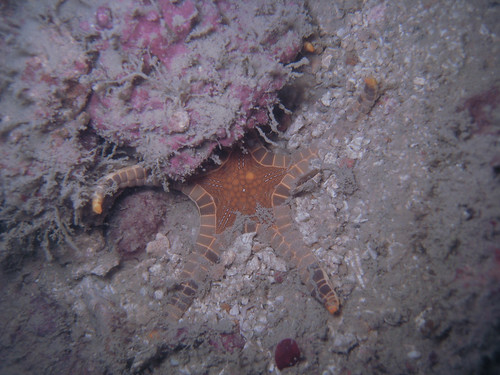 Here’s an Icon seastar half buried and half tucked into a crevice. 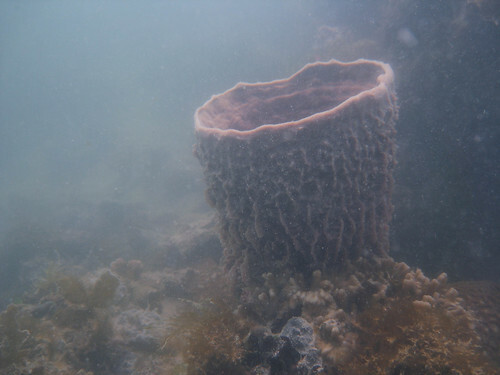 A beautiful barrel sponge. 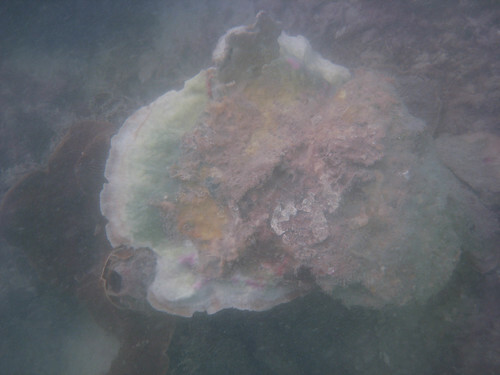 You can see again, along the base of this sponge, the same brownish, delicate algae that the Honeyhead damsels “grow” and feed on. It was a beautiful day out on the reef. 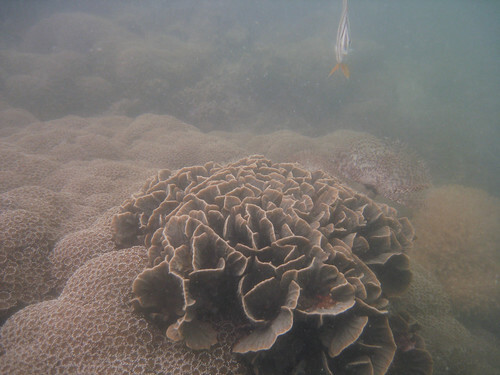 I always enjoy visiting the “Goniopora coral garden”. 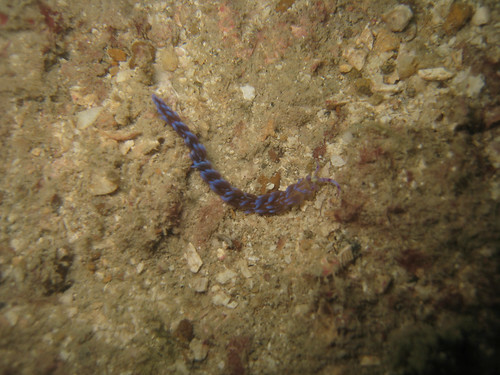 We often see razorfish there and schools of yellowstripe scad Selaroides leptolepis. In this photo, we see one lonely Long-nosed butterflyfish (they usually occur in pairs). Lots of damselfish schooling along the reef flat. Along the reef slope, some very heavy silting, unfortunately. 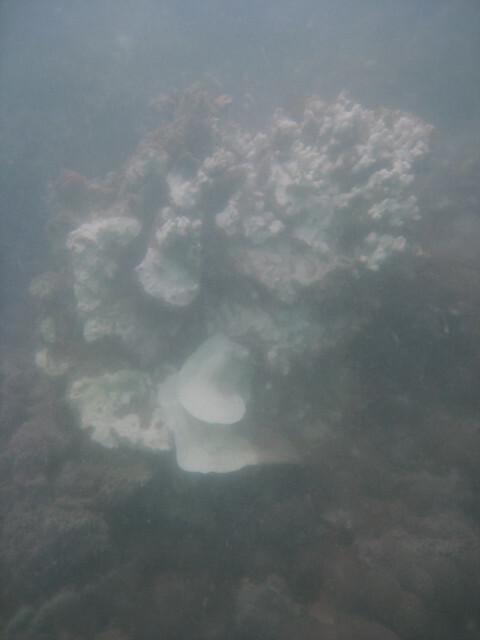 I am amazed how the coral survive amidst these conditions! 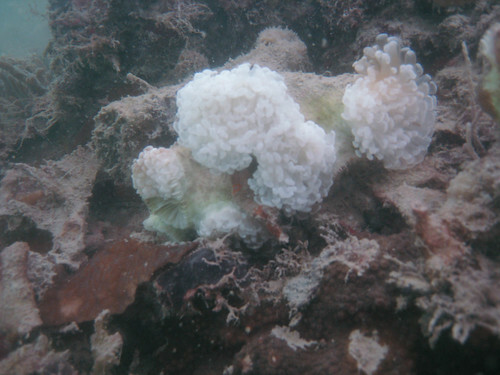 While our last visit seemed to suggest that most of the corals have recovered from the bleaching, we encountered several colonies of corals bleaching, like this large colony of Pachyseris coral. 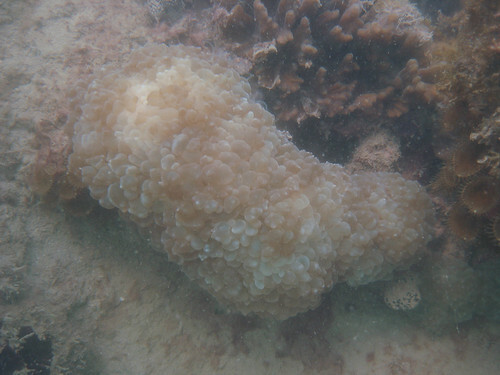 Some Goniopora were also bleaching. 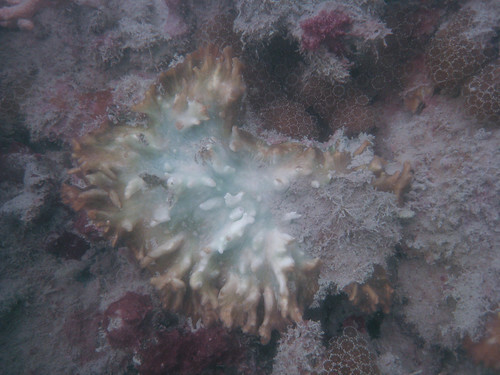 Even the Euphyllia was bleaching. 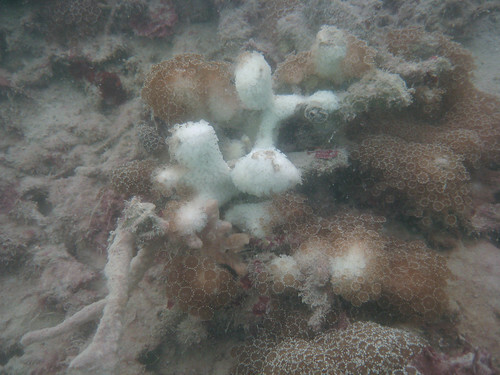 This Pachyseris coral colony looks like it did not survive the bleaching. It’s right half has already died. Another colony bleaching. 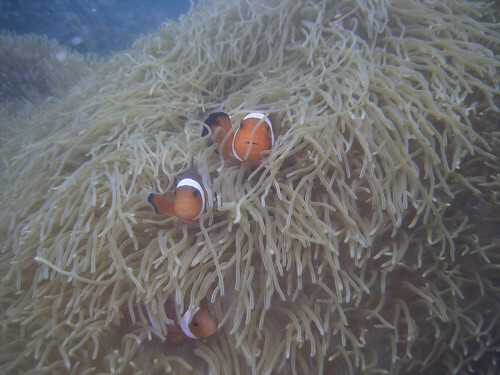 I hope the bleached corals recover soon. 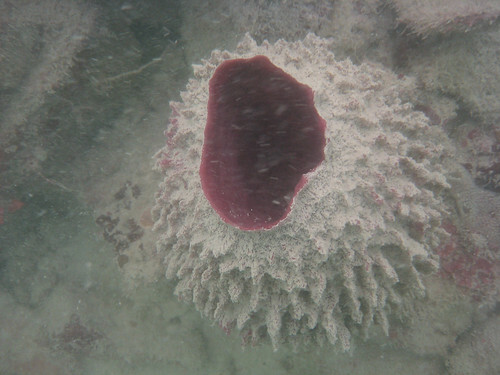 As for the corals that have died, hopefully they will be quickly encrusted and new colonies established. On the way up from our last dive, a remora (also known as suckerfish) latched on to the fins of one of our divers. What you are looking at is actually the belly of the fish. The remoras are a family of ray-finned fishes in the order Perciformes, and can grow to 30–90 centimetres long. What is actually their first dorsal fin has been modified into an oval sucker-like organ with slat-like structures that open and close to create suction and take a firm hold against the skin of larger marine animals (or divers!). 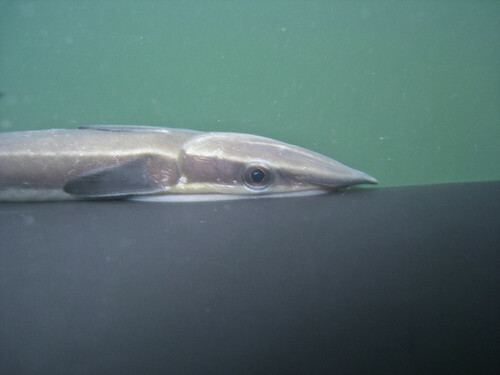 By sliding backward, the remora can increase the suction, or it can release itself by swimming forward. They swim well on their own, with a sinuous, or curved, motion. Remoras are commonly found attached to sharks, manta rays, whales, turtles, and dugongs. Smaller remoras also fasten onto fish such as tuna and swordfish, and some small remoras travel in the mouths or gills of large manta rays, ocean sunfish, swordfish, and sailfish. The relationship between a remora and its perfect host is most often taken to be one of commensalism, not parasitic. The host to which it attaches for transport gains nothing from the relationship, but also loses little. 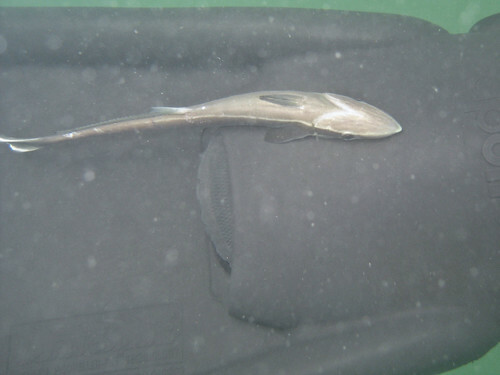 The remora benefits by using the host as transport and protection, and also feeds on materials dropped by the host. In some species, consumption of host feces is strongly indicated in gut dissections. For other species, such as those found in a host’s mouth, scavenging of leftovers is more likely. On rare occasions, remoras that associate with sharks may end up as their prey as was the case of a lemon shark devouring a remora that attempted to adhere to it. Speaking of sharks, here’s a Bamboo shark video that was shot by one of our divers Aaron Koh with his GoPro!